Bill Light died on April 13, 2017 at age 76. Below is a letter I wrote and his children read to him a few days ago. 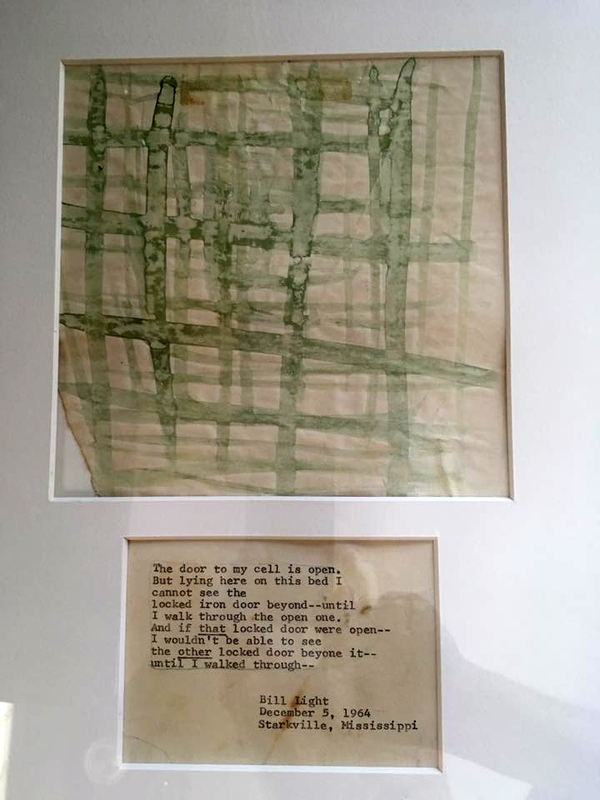 The attached poem and painting were created by Bill in 1964 shortly after his release from the Starkville Jail. Death puts our lives in perspective. Your friendship has meant so much to me. We met when I was just an 18 year-old kid right out of high school. You were the older college graduate, an engineer who chose to come to Mississippi to help out the freedom movement for a few months...and then decided to stay. There were three of us on the project. You and our project director Ron Bridgeforth and me. We both jumped into unknown territory, dangerous work, and an opportunity to learn so much from local heroes facing far greater risks than we were. There was Mrs. Lora Graham out in Maben so strong and tough that the Klan feared coming into her neighborhood. There was Sidney Lomax and his wonderful wife Virgie right down the street from us in Starkville. They had indoor plumbing and let us use their bathtub to wash up and their kitchen for making hot breakfasts of eggs, grits and biscuits from scratch. Then there was the black doctor, Douglas Connor, who treated us for free, and the elegant, tall Lester Evans who ran the barbershop downtown where men gathered and gossiped. And the folks at the Circle Inn truck stop out on Highway 82 where we would go and read aloud poems by Langston Hughes. You insisted that we should open a Freedom School to teach older people how to register to vote, even though in 1964 that seemed like a pipe dream. And you put your heart and soul into encouraging the school age kids to paint and write poems. I still have your jailhouse poem and painting framed on my wall. Working and learning from you meant so much then and has continued to all through my life. I cherish nothing from those days more than your friendship. Facing our fears together. Walking door to door. Trying new approaches of outreach to the community...together. Listening to jazz and R&B on our phonograph on the front porch of our one and a half room shack as we shaved using water from the spigot in the front patch of dirt and weeds. Running out through the winter's cold rain to the outhouse in the back. Talking late into the night about our lives. Back then we had short lives but long conversations...how could that be? Your voice was always soothing. Your perspective was always positive. Your friendship was always solid, reliable, enduring. And is forever important to me. As I look back at my life, I feel fortunate to have met and worked with wonderful people on important projects promoting social justice. Bill Light was a gentle, caring man. Bill was open with sharing his feelings and what was going on in his life. This made for long deep conversations. And it allowed his friends to feel close to him and to help him. He fought to live as long as he possibly could against cancer, a stroke and heart problems. A Stanford grad, in Engineering, I think what he saw happening in the civil rights movement caused him to change his life's work. He loved his chosen profession of carpentry. He proudly showed photos of beautifully crafted furniture he had designed and made. We became friends from our civil rights work in SNCC 1964-65 when we both lived and worked in nearby small towns in northeast Mississippi. Later in San Francisco I remember him from the many anti-Vietnam war demonstrations in Golden Gate Park. He would come with his beautiful young daughter on his shoulders. I think I'm one of many who considered Bill a dear friend. I first met Bill 53 years ago. I remember the month, the day, the time...as if it was yesterday. It was 6 o'clock on a Sunday, June 21, 1964. That was the day the three young civil rights workers, James Cheney, Andrew Goodman and Mickey Schwerner were arrested, turned over to the KKK, beaten, shot and buried on a farm near Philadelphia, Mississippi. Bill was manning the phones at the COFO/SNCC state-wide office in Jackson, MS. I was on duty at the national SNCC office in Atlanta. We talked by phone many times that night, coordinating our efforts to reach out to hospitals, police and the FBI in our futile search for our comrades. And we continued to talk over the next three months. Three months later, in September of 1964 we had the opportunity to meet in person and work together on the same project in Starkville, Miss. There were three of us on that project, the two of us and Ron Bridgeforth who sends his love to Bill's family. We lived and worked out of a two room shack...spigot in the front yard, outhouse out back, a pay phone and a mimeograph machine. Bill was as impressive at 23 as he was at 76. He had a commitment to teaching young folks and to organizing their parents, to empowering exploited communities. For me, a young guy just 18 years old away from home for the first time...Bill was a great support. And not only for me. Bill was the glue that held the project together, the calm presence that boosted our morale in good times and in the hard and scary times. I want to read you some of Bill's own reflections from those times. This is from a discussion among Mississippi civil rights veterans, moderated by Ron Bridgeforth and recorded two years ago. To be a great humanitarian and advocate for social justice, you do not need to be fearless fighter. You just have to dig in and commit yourself in spite of your fears. "I'm Bill Light. I worked in Mississippi from June of 1964 until September of 1965. In June of 1965, I went down to Jackson from Starkville to participate in a demonstration supporting the Freedom Democratic Party. "We were to march from Morningstar Baptist Church to the state capitol. "A couple of blocks short of the capitol the police started arresting us for parading without a permit under a law that had already been declared unconstitutional. "Now, I had already been in Mississippi well over a year. I'd been arrested three times. I'd been threatened many times. I'd been in cars chased (by armed Klansmen). "But I'd never actually been physically abused up to that time. This was my fourth arrest. "We were all herded into trucks fitted with wire mesh cages trucks that had been used for hauling trash. "We were taken to the state fairgrounds and crowded into an exhibition hall. (It was locked. It was a makeshift jail) "Wave after wave of us were brought in, and soon there were hundreds of us surrounded by an ever tightening circle of Jackson police officers bearing billy clubs. "It was stifling hot, and tempers were high on all sides. Every person in that room was angry. The cops were shouting at us. We were shouting at them. "There was an intense feeling of danger, and a dam of emotion was about to burst. "I found myself foolishly meeting the eyes of one particular cop, and he was meeting my eyes right back at me. "With no immediate provocation, the cop hit me on the skull with his club, and I went down in a blinding flash of pain. (Blood flowing profusely) from my scalp. "Three of us were taken by ambulance to a hospital where (they stitched up my head) and then taken back to the fairgrounds. "Several days later, I was interviewed by two FBI agents. They showed me a book of mug shots, and I pointed out the cop (who beat me). As I was describing to one agent how the cop raised his club to hit me, the other agent interrupted me in mid-sentence and demanded to know if I had been a member of the Fair Play for Cuba Committee at Stanford University, my alma mater. "That was where the FBI's interest lay, not in investigating my beating, but in investigating those of us opposing segregation. "About 800 of us were held at the fairgrounds for eight days. We tried to keep our spirits up singing Freedom songs and playing chess with chess sets made from plastic forks and spoons. Eventually, they just let us go. "Although my injury was not serious, that beating was a significant event in my life. "In the Movement, we frequently claimed that violence against us didn't work, that it only made us stronger and more determined. "But, that beating really took the wind out of my sails. The anger, fear and helplessness stayed with me for years afterwards. "I lost a lot of my spark and frequently found myself afraid to assert myself. It took me a long time to make the connections and identify the source of my malaise. "Eventually, with the help of therapy and meditation, I was able to put the problem largely behind me. But that fear really got me, and I still get flashes of it sometimes." Those are Bill's own words. But, it is important to note, he didn't give up. He didn't pack up. He didn't head north. He remained in the midst of that hard and dangerous struggle for another three months. And as you know, he remained a peaceful warrior for social justice for the rest of his life. If you allow me, I want to say something else about Bill and Mississippi. There was another reason Bill left Mississippi discouraged. It was hard then just as it is today to know if what you are doing is making any difference. Many folks from that struggle left unsure if anything had changed. Decades later, Bill and I and Ron Bridgeforth journeyed back to Jackson, Mississippi for the 50th Anniversary conference on the 1964 Mississippi Summer project held at Tougaloo College. Two really important things happened that week that brought some joy and closure to Bill's feelings about his role as a civil rights activist. This was the first. On June 28, we met a Black professor from Mississippi State University. A Black professor. His name is Stephen Middleton and he heads the African American Studies program at MSU. Back in 1964, the only blacks on campus worked in the laundry or the kitchen, earning $50 every two weeks for full time work. We later renewed our contact with folks who were the Starkville community leaders fifty years ago. They also credited the SNCC project for nourishing a local movement that later flourished. And this is the second. The day after meeting Professor Middleton, Bill, Ron and I planned to drive up to Starkville. But, Bill Got Sick. VERY SICK. He had bravely taken this trip to participate in the reunion in spite of his ongoing pancreatic cancer treatment. Ron and I wondered what should we do. The conference had just ended. The doctor at Tougaloo College had left and was nowhere to be found. I called Julian Bond for advice and reached him at the airport just before his plane took off. He told me to call Dr. Michelle Owens, Chair of the Obstetrics Department at University Hospital in Jackson. Dr. Owens quickly responded, cut through the red tape and had Bill admitted in minutes. When she met him in his room, an IV was already flowing and the X Ray had located the problem, a dislodged stent. Bill's smile was back and he started to express his gratitude. That's when Dr. Owens, a black woman from Alabama interrupted him. Now it was the doctor who became emotional as she told Bill how grateful SHE was for what HE had done decades before. "I wouldn't be here if it wasn't for you," she told him. "I wouldn't have become a doctor, I wouldn't have been admitted to practice here, I would never have been appointed Chair of Obstetrics." The truth is, Bill's commitment made a huge difference in the lives of many people. Thankfully he lived long enough to hear it himself.